Felt tired all day today. Didn’t sleep well the night before. I can feel the “Detox” packets are working but its draining all the energy out of my body. Ill be happy to be done with phase 2 of the Ultimate Reset. Breakfast was interesting. We had mashed chickpeas, steamed spinach, and avocado. Lunch was another Microgreen Salad and Mediterranean Roasted Beets which tasted great. Dinner challenged my cooking skills. 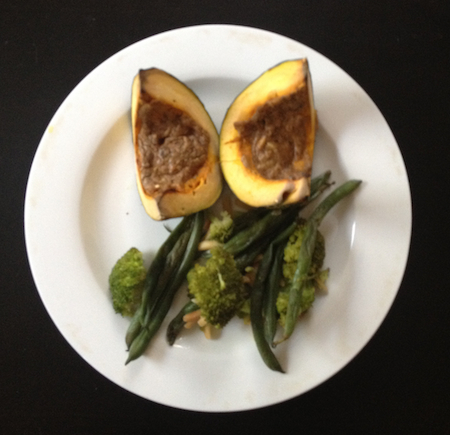 I successfully made Kabocha Squash with a fancy Garlic-Tahini filling served with steamed vegetables. It turned out pretty good.